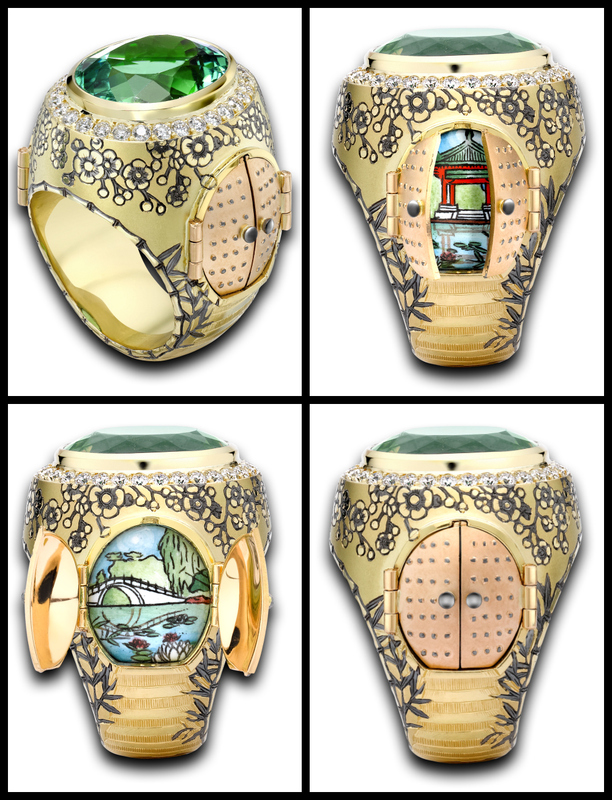 You are here: Home / Jewelry / Theo Fennell masterwork: Chinese Secret Garden ring. 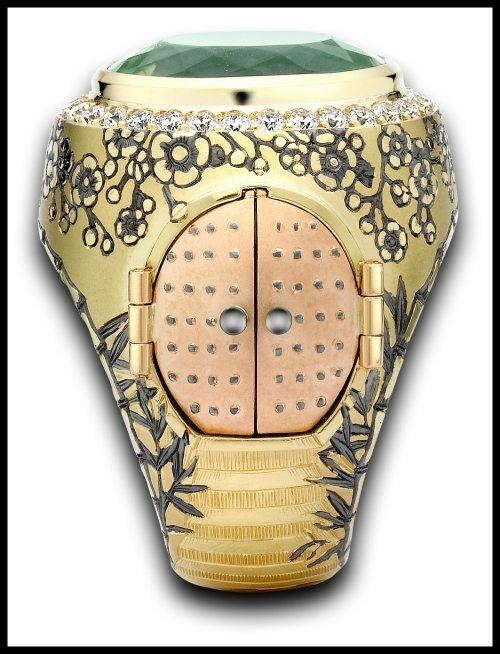 Theo Fennell masterwork: Chinese Secret Garden ring. If you caught my “to infinity and beyond” dream jewelry gift guide (or if you read me on Book Riot) you’ve seen Theo Fennell’s work before. 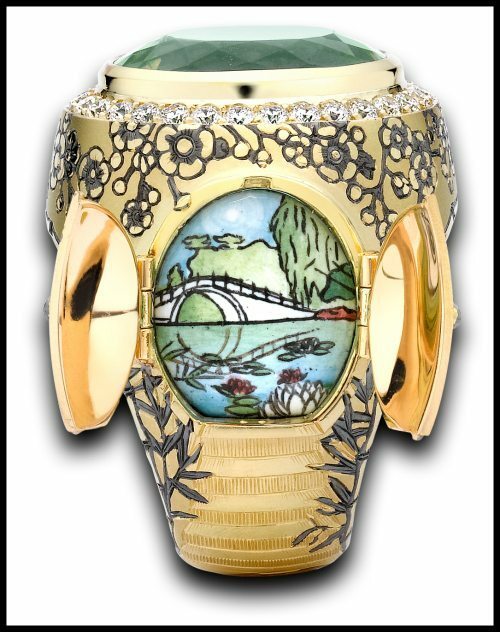 This beauty is the Chinese Secret Garden ring from the Theo Fennell Masterwork collection. (The name of the collection is self explanatory, I think.) 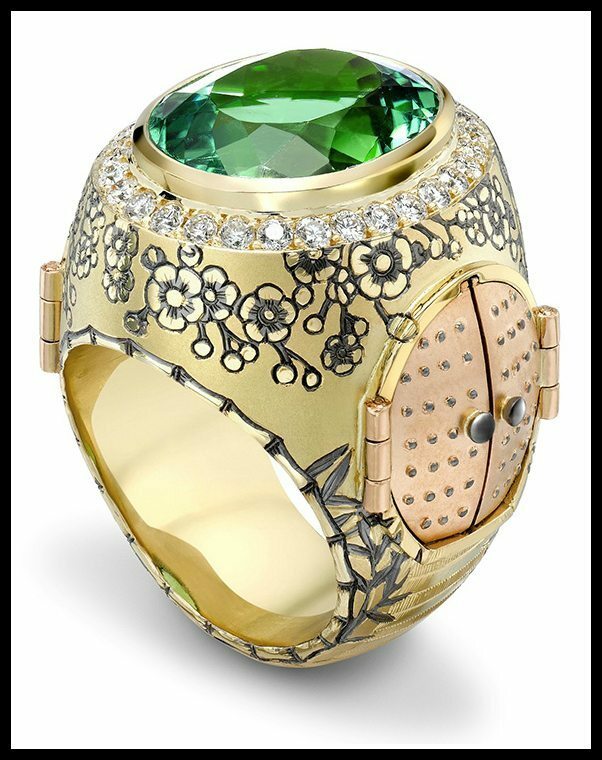 This piece – striking at first glance with its engraved yellow and rose gold topped by a brilliantly green 12.53 carat tourmaline and wreathed in diamonds – is even more incredible than it initially appears. So, right off the bat you have the beautifully worked gold, the engraved blossoms and bamboo, the color contrast of the yellow and pink metals, and the tiny lovely doors. But guess what? They open. 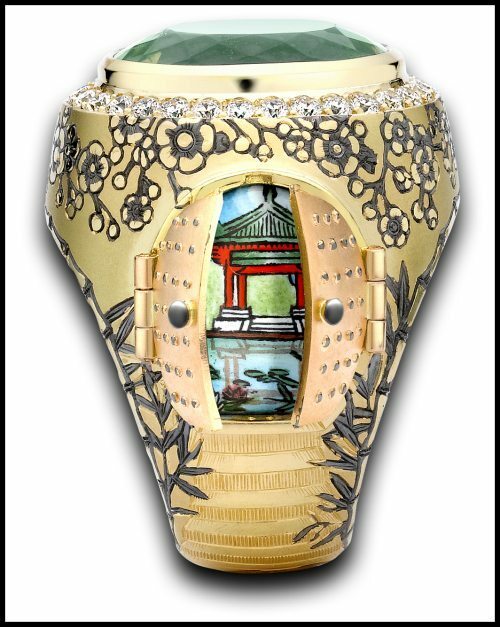 The name of this piece is the Chinese Secret Garden ring; this is the secret garden, a breathtakingly lovely scene in enamel. Look at the reflection of the bridge in the pond, the wistful lines of the willow trees. Here’s the view from the other side of the ring (because of course we want to see the other side of the secret garden). Don’t you want to run up the tiny golden steps and lounge in the pagoda? I bet there’s a lovely, soft breeze. When you wore this ring you would have your own teeny tiny secret garden on your finger all day. It fills me with delight. A Masterwork indeed, Mr. Fennell. All images and info in this post are thanks to Theo Fennell.